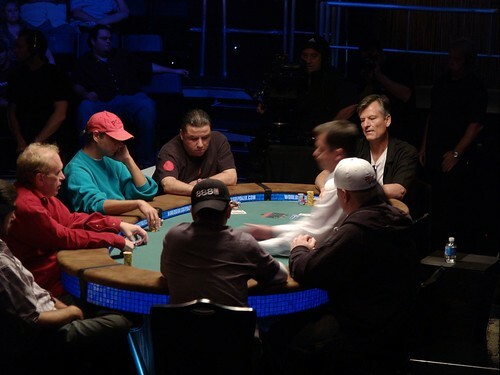 Photo of the 2007 World Series of Poker by on2wheelz used under a Creative Commons license. A. Alvarez, The Biggest Game in Town (Chronicle Books, 2002). Originally published in 1983, an account of the 1981 World Series of Poker in Las Vegas. Much of it was first published in The New Yorker as character sketches of the card players, like Amarillo Slim, Nick the Greek, and Doyle Brunson. The players are different now, the center of Vegas has moved from downtown to the Strip, and the tournament has gone big-time, but Alvarez’s writing still holds up. You don’t have to play Texas Hold ‘Em to enjoy it, though it probably wouldn’t hurt. Google BookSearch gives you a preview. Wikipedia has this bio of Alvarez. This appears to be an excerpt of sorts. C. Max Magee sees the early days of big money. Christopher Lehmann-Haupt (The New York Times) says Alvarez writes with elegance and wit, but decides that the book is less than the sum of its parts. Saul Goodwin (National Review) says Alvarez offers a memorable view of Las Vegas. Joseph Epstein (The New Yorker) cals it an excellent account. Troy Patterson (EW) calls it a linked series of subtly freakish portraits. Nick Christenson calls it a pillar of the poker literary canon. John Skow (Time) says Alvarez’s account is as close to Binion’s as a prudent soul will venture. Observer says this is the one book to read about the Las Vegas poker culture. Todd Wheeler says it’s a great book even if you don’t know poker. Joon-Soo Kim likes the historical perspective on Vegas poker. Laurence Phelan (The Independent) says it’s a fascinating study of extreme gamesmanship. Murphy James is fascinated by Alvarez. The big game in Sin City. 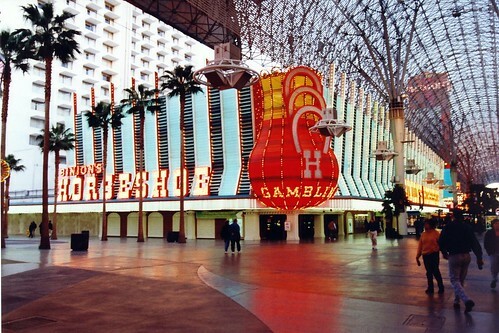 Photo of Binion’s Horseshoe by wallyg used under a Creative Commons license. James McManus, Positively Fifth Street (Farrar, Straus & Giroux, 2003). In 2000, McManus persuaded Harper’s to send him to Las Vegas to cover the World Series of Poker and the trial of the murderer of Ted Binion, of the family that founded the No Limit Texas Hold ‘Em event. McManus gambled his entire advance to enter the competition, and ended up doing far better than he could have hoped. In the telling, his success on the felt gives the book a certain velocity, even as he steps away to cover the murder trial and relate some of his own life. If you have no time for Texas Hold ‘Em, then I suppose this book might not grab you, but then why are you reading about Vegas? Google Book Search offers a peek at McManus’s hand. January Magazine offers an excerpt too. Jodi Wilgoren profiled McManus in The New York Times in 2003. James Browning’s review in The Believer stands out. Lots more reviews: Hagen Baye (Mostly Fiction), Joe Hartlaub (Bookreporter.com), Jason Kirk (BlindBetPoker.com), Michiko Kakutani (The New York Times), Robert R. Harris (The New York Times), Jamie Berger (San Francisco Chronicle), Deano (BlogCritics), Nick Christenson (ThePokerForum.com), Todd Leopold (CNN), John, David, Mark Flanagan (About.com), Aaron Todd, Daniel Fierman (EW.com), Observer, C. Max Magee (The Millions), Milbarge, Lev Grossman (Time), and Ian Anderson. Here’s an interview at PokerPages.com, and here’s one you can watch. Tim Harford drew on the book to write about poker reasoning. Jack Bogdanski notes that the “murderers” got a new trial and eventually were acquitted. After the book came out, McManus wrote “Further Adventures in Poker” for Esquire. He wrote “The Biology and Eros of No-Limit Hold ‘Em Tournaments” for Cardplayer.com. He also has written for The New Yorker about Senator Obama’s poker game. And he appeared on To The Best Of Our Knowledge, on Wisconsin Public Radio.